The viewfinder of Templeton's 1950s model SLR only allowed him to see 70% of the scene. 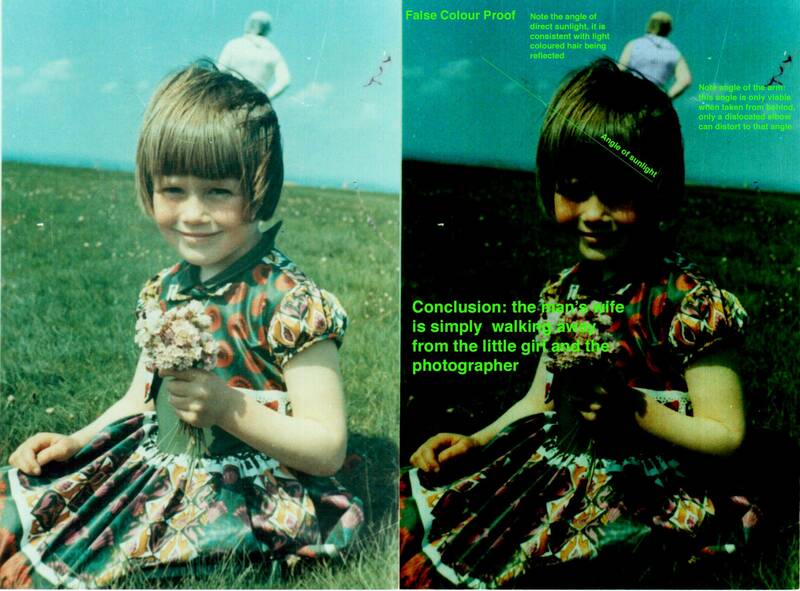 The Solway Firth Spaceman (aka the Solway Spaceman and the Cumberland Spaceman) is a supposed mystery figure captured in a photograph taken by amateur photographer Jim Templeton in 1964 on a marsh near Solway Firth in Cumbria, England. It has been variously claimed in woo circles as photographic evidence of an extraterrestrial, a ghost, or a time traveler. Templeton's wife on the right. The upper part of her blue dress overexposes as white. On May 23, 1964, Cumbria resident Templeton took his wife and two daughters on an outing to scenic Burgh Marsh. While there, he snapped some family photos using his late 1950s model Zeiss Contax "Pentacon F" SLR camera. Templeton claimed that when the photos were developed, the local developer remarked that one contained a very mysterious background figure that appeared to be wearing a space suit. Templeton swore he didn't see any such thing when the photograph was taken. He also swore he and his family were alone on the marsh that day. Gossip of the strange photo spread fast, and soon the photo was published in the local, and then the national British newspapers. The integrity of Templeton's camera and original negatives were allegedly vetted by Kodak. The mystery photo rapidly gained the 1964 equivalent of viral status when world wide press picked it up, and a Ufology legend was born. Templeton claimed that shortly afterwards he was visited by two strangers wearing dark suits and driving a Jaguar who said they were Government officials. Supposedly, they took Templeton on a drive to Burgh Marsh during which they alternately questioned and threatened him unless he admitted he'd hoaxed the photo. Templeton claims they ejected him from the car when he would not cooperate and made him walk back to town. Later, he told a newspaper he thought the incident had been a joke played on him. Templeton also claimed a technician from the Blue Streak missile project in Woomera, Australia contacted him and told him that a missile launch had to be aborted because similar-looking "spacemen" were seen wandering around the launchpad. There are no records of any such incident to substantiate Templeton's second-hand claim. Neither the late Templeton nor his family ever admitted to hoaxing the story or the image, and allegedly were convinced something mysterious had been captured on film that day. The mysterious spaceman story might have rocked on forever as one of Forteana's greatest hits were it not for the denizens of a number of internet forums who wielded Occam's Razor with deadly accuracy. A photo analyst demonstrated that the “spaceman” was nothing more than an adult person of normal height with their back to the camera walking away from the child. Others observed that another photograph taken that day shows Templeton's wife, Annie, wearing a very light blue sleeveless dress. Closer examination of the original "spaceman" image reveals that the arm of the mysterious figure has a decidedly tapering, feminine curve to it. Exactly like the bare arm of a woman wearing a very light blue sleeveless dress. Her back to us, she is probably wearing some kind of white cap over her close-cropped hairstyle. Enhancing the contrast of the photo further reveals the distinctive neckline and arm holes of her dress. The famous "spaceman" illusion was created when Annie Templeton inadvertently photobombed the snapshot taken by her amateur photographer husband. He didn't see her in the background due to the blind spot in his Pentacon F SLR camera's viewfinder that only allowed him to see 70% of what the lens was capturing. This is backed up by the other photo taken that day that shows his wife, again caught in Templeton's blind spot. So Templeton's lifelong claims were technically sincere: there was no one else with them that day, and he really didn't see anything other than his daughter when he took the photo, and the photograph wasn't manipulated, faked, or staged in any way. Templeton may have been honestly puzzled by the photo, at least initially. But given the improvements in SLR design over the years, it's hard to imagine photo hobbyist Templeton never discovered his vintage camera's notorious blind spot. It's more likely that possible public embarrassment prevented Templeton from changing his "mystery" story once it became cemented as fact by the world wide press. It's also quite possible that Templeton was fully aware that his chance photo mistake had created a perfect vehicle for mass misinterpretation and pareidolia, but he enjoyed the attention gained by the photo so much that he encouraged the mystery and even promoted it over the years. And given the choice of having her husband seen in the press as either a bungling amateur photographer or someone who captured evidence of something mysterious, no doubt his wife Annie would have chosen the latter. Yes, the spaceman is just standing backwards. And wearing a dress. ↑ Annie Templeton. Her hair was dark and collar length. ↑ Photo.net"One of the features of the Contax S/D/ Pentacon F is that it has a primitive plain-glass view screen for focusing, which makes the finder image quite dim and only really sharp in the centre. The viewfinder image is quite restricted and shows approximately 70% of the frame. Therefore an object at the very edge of the frame may not be seen before taking the picture." This page was last modified on 26 February 2019, at 23:17.